Today I want to show you guys some progress photos of my current sewing project. The coat is almost done, I only have to sew the buttonholes, stitch in the buttons and apply the shoulder pads (they are just roughly pinned in place at this stage). Viva pessoal, hoje queria mostrar-vos algumas fotos do projeto de costura que está em execução no momento. O casaco está quase pronto, falta fazer as casas, aplicar os botões e os chumaços (neste momento os chumaços estão mais ou menos no lugar presos com alfinetes). The pattern is from Burda International magazine (April 1996, mod 912) and was originally a dress, but I decided to turn it into something that could double up as a spring coat too. I changed the front opening into a top down faux placket (it’s “faux” because there's actually a facing inside; the illusion of a placket is created by the fabric folding into a tuck and then top-stitched; the excess fabric introduced by the tuck was added to the pattern, of course). 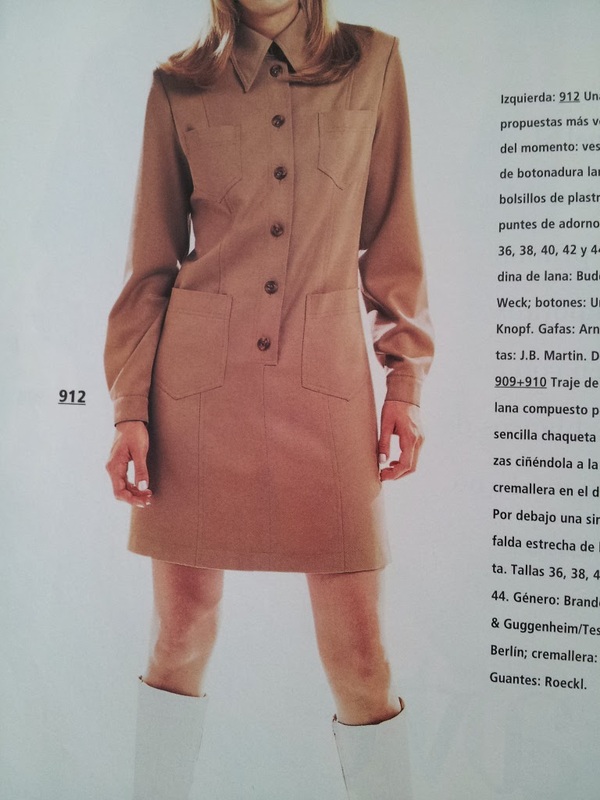 O molde é de uma revista Burda Internacional bastante antiga (Abril 1996), modelo 912, que corresponde a um vestido com abertura frontal parcial. Decidi modificar o molde para que funcionasse também como casaco, o que envolveu fazer a abertura frontal até abaixo. Para criar a ilusão da carcela de botões aplicada (estilo camisa) introduzi uma dobra no molde que depois é pespontada. Na realidade a parte frontal contém uma vista seguida (à semelhança do que acontece nos casacos forrados). The fabric (faux suede) has been a pain to work with when it comes to ironing: I need to use very low temperature setting and ALWAYS a press cloth between the iron and the fabric. I originally intended to use buttonhole thread for the top-stitching but after a few samples I've given up the idea (the larger needle needed with this kind of thread would not pierce this fabric easily). When dealing with several layers of fabric the stitch length shows some unevenness too, but this happened only because the fabric feed is increasingly difficult with so much bulk. I hope to get the coat finished by the end of the week ( so I can start with Paco's new pattern next) so stay tuned! Espero concluir o casaco até o fim da semana para depois começar com o novo molde do Paco, mantenham-se atentos!